It’s the rare Phoenix home that doesn’t have some need of upgrades or repairs. Even if you move into a brand-new home, it’s highly likely that you’ll want to make some changes so that the house better suits your preferences. You can hire a home remodeling contractor in Phoenix to handle the major renovations such as replacing the roof or putting in new floors, but there are a few projects you can handle yourself if you are on a budget. Just keep in mind that the money you spend is not always the money the whole project costs. For example, if you try to do something outside of your skill set, you could end up costing yourself a lot more money down the line by having to hire someone to redo the work or to repair what you damaged. So saving money up front doesn’t always translate to long-term money savings. Your house can easily be aged or look more run down if the hardware is dated, rusted, or otherwise blemished. You can replace the hardware on your kitchen or bathroom cabinets and drawers, your doors, or even your sinks or shower doors. Doing so will cost much less than replacing these items entirely, and it will make them look like new in many cases. If you don’t want to replace the hardware, or if you don’t have the money to do so, you can get the look by using a can of Rustoleum spray paint. Just make sure you choose the kind that is meant for metal. Tape off the area that shouldn’t get paint, and then spray the hardware in even coats until you get the desired color or saturation. Don’t overspray or you’ll get drips! If you’ve done the job right, you’ll get an even, beautiful finish that will make the hardware look like new. You can paint door knobs, hinges, draw pulls, air vents, shower door frames, and anything else that’s metal. A lot of bathrooms have a simple builder-grade mirror hanging on the wall with plastic or metal hooks. It looks perfectly adequate, but it’s kind of boring. You can make the bathroom look more sophisticated by giving the mirror a border. You have plenty of options for framing the mirrors. You can buy basic molding and use a miter saw to cut the angles for the corners. Or you can make straight cuts and use decorative wooden rosettes for the corners. You can also use glass tile to make a mosaic border. For whatever material you choose, you should be able to use liquid nails or another adhesive to attach it to the mirror. Just take your time with the measurements and the cuts to avoid mistakes. Granite is expensive – and for good reason. It is a beautiful, elegant stone that is long-lasting and durable. People love it for their countertops. But if you don’t have the budget for granite, you can still get the look of granite with a specialty paint. Pick up a DIY granite kit at your local home improvement store and follow the directions. You’ll basically be painting the surface with different colors of paint with a sponge. You’ll create the dappled look of granite in layers of paint. Just don’t use the granite paint kit on something like the floor. The paint will eventually wear off and peel away under all the foot traffic. Making a few simple renovations to your Phoenix home can update its look and make it a more enjoyable space for you and your family. It’s best to do these projects before you move in so that you don’t have to worry about moving furniture and other items. You’ll just be creating more work for yourself. Better to do the job while the house is empty! Of course, it’s even better to hire a Phonix home renovation company to do the work for you, ensuring that the job is done right and you get beautiful results. 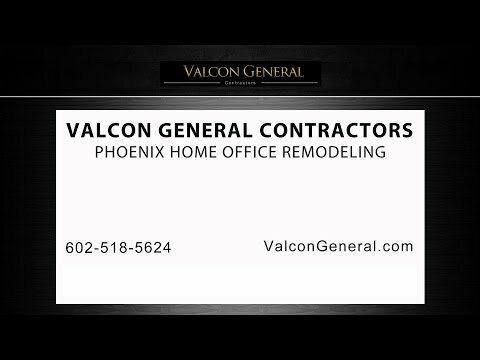 Valcon General is a home renovation specialist in Phoenix and can help you with renovations ranging from updating your hardware to putting a whole new room onto your house. A home remodeling contractor will meet with you to discuss your goals and your vision for the house and will then make recommendations to get the best results on the budget you specify. Contact us today to talk with a home remodeling contractor and start making the changes you want to your home.